Keep moving forward, regardless of the odds are words that University of New Mexico student, Cindy Nava lives by. She came to this country at the age of six with her brother and sister because the conditions in Mexico were difficult and her parents wanted a better life for them. When Cindy came to UNM, she faced the financial burden of having to pay for classes on her own, because she wasn’t eligible for federal funding. She couldn’t apply for a job, because she didn’t have a Social Security number. Four days a week, she was up at the crack of dawn hustling to make the train from Santa Fe to ABQ. 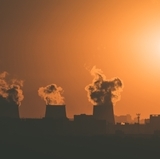 Her days were filled with classes, fellowships and internships. She got home after seven, ate her dinner, then did her homework and fell into bed around midnight. She maintained that routine for four years, all the while afraid that the INS might come knocking and send her back to Chihuahua, Mexico, a place that is now totally foreign to her. She was also afraid that, as a first generation low-income student, she might not succeed with all the obstacles in her way. Nava regularly searched for internships, fellowships, scholarships, any programs that could assist in paying for her classes. The first people that opened doors for her at UNM were Meriah Heredia Griego and past Director of El Centro de la Raza, Veronica Mendez Cruz. They not only supported her financially and academically but the center became a home away from home. 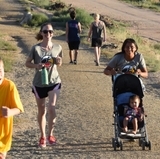 Eventually, she was guided to UNM’s ENLACE, a statewide organization made up of passionate leaders who represent the voices of underrepresented children and families who have not traditionally had a say in policy initiatives that have had direct impact on them. There, she met Executive Director Lawrence Roybal, who immediately provided her with much of the support and guidance she needed. "Cindy is a tremendous asset to the university, the Land of Enchantment and the country,” Roybal said. “She is very committed to supporting our students and families and to building community across the state. There is no doubt that she will realize great success in her professional pursuits and continue to inspire others to achieve their aspirations and dreams. We are extremely fortunate to have such a respected student scholar and admired community leader in our midst." 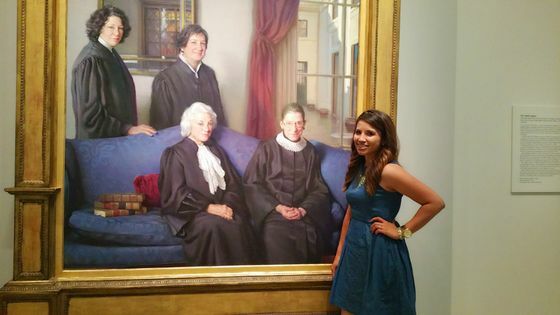 Cindy Nava poses in front of a painting titled, "The Four Justices" on display in the Smithsonian's National Portrait Gallery, Washington, D.C. In 2013 Nava went on to serve as Executive director of governmental affairs for ASUNM. In the academic realm, Nava found that generating a relationship with her professors was the best way to learn class content and to further her academic passions, which are education, policy, immigration, access to health care and law. And what better place to put her passions to work than the New Mexico legislature. 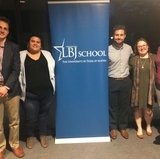 Nava completed numerous internships through the UNM political science department with New Mexico legislators, most recently working in Senate Majority Leader. Michael Sanchez’s office where she gained broader knowledge and experience of state politics through involvement in advocacy, policy creation, community organizing and bill analysis. Last year, she received a National Fellowship by People for the American Way, conducting a social justice model revolving around the New Mexico lottery scholarship. She attended many community meetings concerning lottery solvency and assisted community organizers advocating for affordable college education, access to healthcare and immigrant rights. Nava recently returned to New Mexico from Washington, D.C. where she served with a cohort of summer fellows from across the country at the Democratic National Committee Headquarters as a member of the political team to help organize for the next election cycle. She was able to do that because in 2012, President Obama created a new policy calling for deferred action for certain undocumented young people who came to the U.S. as children. Applications under the program which is called Deferred Action for Childhood Arrivals (“DACA”) began on Aug. 15, 2012. However, due to a complicated immigration process Nava is still awaiting for her status to be approved. 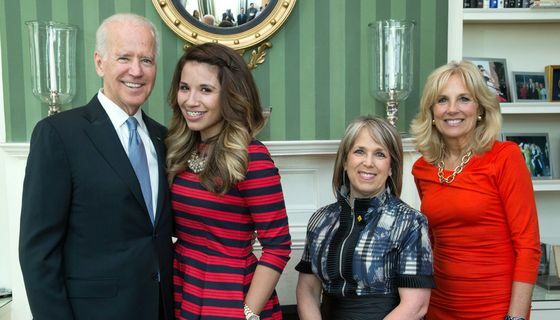 Cindy Nava, second from left, with (l. to r.) U.S. Vice President Joe Biden, U.S. Congresswoman Michelle Lujan Grisham and Second Lady Dr. Jill Biden. Nava is currently enrolled at UNM, working toward her master’s degree in Education Leadership & Policy. Her goal is to one day run for elected office. In the 1939 film, Mr. Smith Goes to Washington, Jimmy Stewart's character, a newly-elected senator, arrives at the Capitol filled with patriotic zeal and poised to take on good causes for the people of his state. In a way, it’s the same for Ms. Nava.